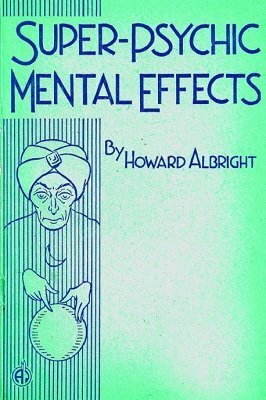 There is a universal demand for good, practical effects in Mental Magic, not only from professional Mentalists, whose very livelihood depends upon the exhibition of Super-Normal Phenomena, but from that vast army of amateurs, who find this type of presentation most effective in small, social gatherings. Because of the very intimate nature of mental problems, they are particularly well suited for impromptu occasions. Under such circumstances, they appear to be most convincingly genuine, and accompanied by a little dramatic by-play, they create a profound impression upon the intelligent audience. To the average person, these experiments will savor of the supernatural, the occult; the "believer" will accept them as demonstrations of genuine psychic powers; and the "orthodox" may look upon them as "works of the Devil". Employing no apparent apparatus and bearing no semblance of manipulation; even the scientifically-minded "skeptic" must admit that they offer a direct challenge to all known physical laws and defy rational explanation. Such is the appeal and the fascination of Mental Magic. 1st edition 1948, 52 pages; digital edition 23 pages.